The first step in how to decorate a Christmas tree is adding the lights. Tree lightstypically come on green or white wire strands, though you can also find black variations now, perfect if you happen to have a black Christmas tree. Choose the strand color that matches your tree so the wire will be hidden. Illuminating your Christmas tree from the inside out will give it the most dynamic look. Start at the base of the trunk and work your way up, wrapping lights around every major branch, moving from the trunk to the tip and back. Here are four popular types of Christmas lights to choose from when decorating your tree. Traditional incandescent lights: These Christmas tree lights, which come in a variety of sizes and colors, are the most popular type of tree lights. They warm up the branches of a real tree, which will release the scent of pine into the room. LED lights: These Christmas tree lights are newer than the traditional incandescent lights and don’t produce heat. They’re typically more expensive, but they are flameproof, fireproof, and completely safe to decorate a Christmas tree with. Experiment with different lighting schemes until you find one you like; it’s OK to mix and match lights. For example, a background of white or clear lights can be highlighted with strands of colored lights that wrap the outer areas of the tree. See our complete guide to putting lights on your Christmas tree for even more info on how to design your perfect tree lighting scheme. This modern geometric wood bead garland would look great on a pared-down Scandinavian-style Christmas tree. To avoid a busy look on your tree, decorate your Christmas tree with a variety of garlands from plain to fancy. Thin, beaded garlands look best hung from branch to branch; thicker paper, ribbon, or foil garlands look best wrapped loosely around the entire tree. If you’re still in need of a garland, consider making one this holiday season! If you love a traditional look, make a cranberry garland that blends cranberries with slices of fresh lime, this wrapping paper garland, or this boiled wool felt garland that’s a twist on the classic popcorn garland. If contemporary is more your thing, try the wood bead garland shown above, this sophisticated crepe paper garland, or this easy DIY pom-pom garland. Ribbon is also a popular alternative to a garland. Loosely wrap wide, patterned ribbon around the entire tree in horizontal bands. To add interest, try making big bows from similar ribbon and using them to decorate the tree branches. To amp it up, use ribbon vertically on the tree, creating cascading streams of ribbon from the top of your tree to the base, tucking the ends under your tree topper and securing around the trunk at the base. 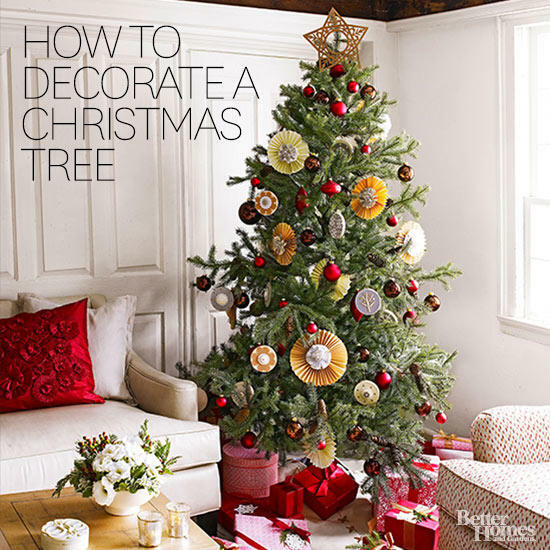 Finish dressing the tree by adding specialty items, such as clip-on ornaments or icicles.